Do you eat well and exercise, but still struggle to lose that last inch or two around your waistline? For years and years, men and women have been searching for ways to remove unwanted areas of fat. No one likes a muffin top or lower tummy pooch. So much so, that we are often willing to try almost anything to achieve a better look. Hundreds of gimmicky devices and treatments have been marketed…and, of course failed to deliver real results. Short of diet and exercise, liposuction is the only treatment that effectively removes localized fat deposits. But liposuction requires surgery. Some people don’t want surgery, or can’t afford to spend the time recovering from surgery. And so, without any effective alternatives, the struggle continues… Until now. Now there is Liposonix® at Cosmetic & Plastic Surgery Specialists! Liposonix® is the latest non-invasive fat removal device to get FDA approval for non-surgical body contouring …and, it really works. Liposonix® utilizes high-intensity focused ultrasound (HIFU) to treat unwanted fat. A beam of high-intensity ultrasonic energy is focused to a specific depth below the skin surface. This intense ultrasound wave permanently destroys the fat cells, but does not affect the overlying skin. The efficient delivery of the ultrasonic energy allows direct treatment of specific body areas, and treatment times of about one hour. Over the next two to three months the destroyed fat is removed by the body’s natural healing processes. There is minimal downtime, and patients are able to return to normal activities the following day. . On average, Liposonix® patients lose one inch off their waistline – equivalent to losing one pants size or dress size. Now that is a result. Liposonix® was developed over a period of more than 10 years by leading scientists, and there are at least seven scientific studies documenting the effectiveness of the Liposonix® treatment. Liposonix® is ideal for those individuals who are within several pounds of their ideal size, but have stubborn, unwanted fat around their waistline. Patients should be in good shape and committed to maintaining a healthy active lifestyle, realistic about their expectations, and be able to pinch at least one inch of fat in the treatment area. Liposonix® is a state-of-the-art solution for those individuals who are close to their ideal shape and weight, but have stubborn areas of fat that just won’t go away despite an active lifestyle. This unique and effective breakthrough treats localized fat deposits without surgery by permanently destroying fat cells below the skin. On average, Liposonix® patients lose one inch off their waistline, which is equivalent to dropping one pants size or one dress size. 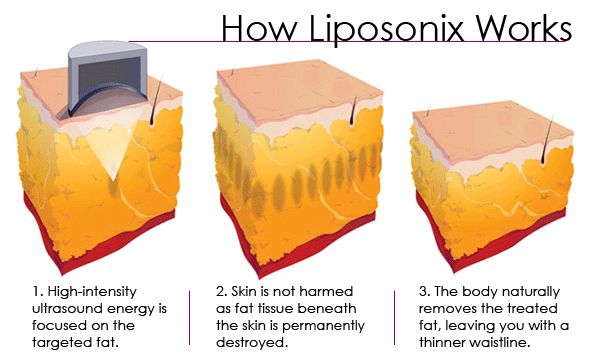 With Liposonix®, you can win the battle against stubborn fat and reclaim that body you desire. Price for tummy? legs? individual sites? 13133 North Port Washington Rd.